Hello again my crafty friend! 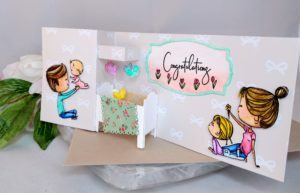 Today, I’ve used new stamps from The Rabbit Hole Designs for another fun, interactive card for you. I’ve combined images from the We Are Family set with a sentiment from the Happily Ever After set to create a card with a crib that pops up when you open it! 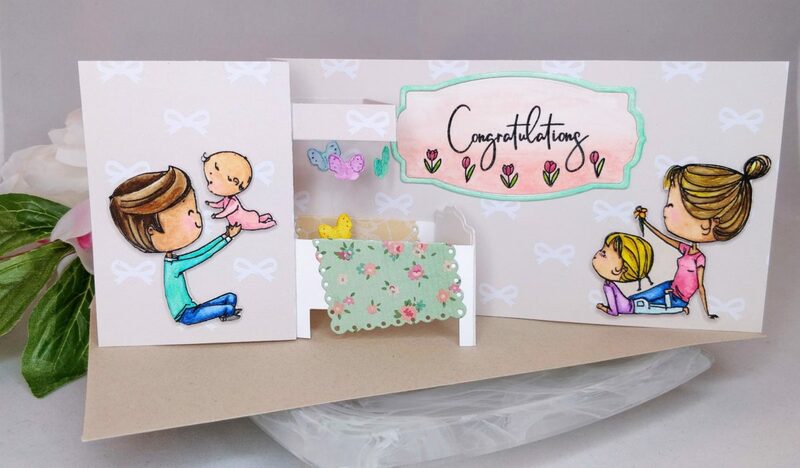 It’s perfect for baby showers, or welcome baby cards. It may seem complicated, but it was actually pretty easy to make. First I stamped and embossed the family images, then used my Prima watercolors to paint them. I used three pallets (classic, tropical, and pastel dreams), but you can mix colors to get lots of shades. Weirdly enough, I use the tropical pallet most often; it seems like you can do almost everything with those colors. Once they were dry, I cut them out with my ScanNCut. (No sore thumbs here folks!) While my stamping and watercolor supplies were still out, I also stamped and embossed the sentiment and a few little flowers from the Easter Bounty set onto a die cut tag, then I painted it. The tag dies I used are nesting, so I cut out a slightly larger frame and painted it aqua to coordinate. I wanted the sentiment to look like a framed picture hanging in the baby’s room. 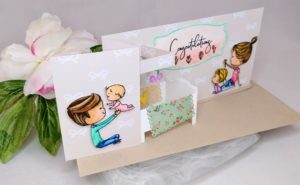 To add a mobile above the crib, I took a 1/2″ x 6 1/4″ strip of the same paper I made the card base with and I folded it at 1 1/2,” 3,” 4 1/2,” and 6.” This forms another little box with a 1/4″ flap for gluing. I taped clear thread with double-sided butterfly die cuts to the center of each section and I suspended a fifth butterfly from a thread that spans two folds. I covered the tape with a second strip of pattern paper, then glued the box into place above the crib. Sandwiching your thread between two layers of paper hides the mess and looks nicer, since you can see both sides of the box when the card is open. A quick note about the pattern papers I chose: for the card base, I chose a soft mushroom color with a pattern that looked like it could be wallpaper in a nursery. Since it’s the background, I didn’t want it to be too bold or you would miss the focal points. The prints for the blankets offer another splash of color and the patterns are small enough to look proportional in the scene. Remember, when choosing patterns, size matters! One more quick note: you can adjust the crib to accommodate whatever tag die you have in your stash. To figure out the measurements, use the width of your tag as the width of the head and foot of your crib, make sure the sides are a little longer so the proportions look right. I always use scratch paper and temporary adhesive to make a model first. That way, I get it the way I like before cutting my good paper, and I can take it apart to measure it. Also, if you adjust the size of your crib, you will need to adjust the score lines for your z-fold. Just add 1/8″ to the width of your tag die to determine how much space you need between score lines on the card base. I hope I’ve inspired you to try adding a pop-up to your z-fold cards. And if you do, please tag me in your posts on social media; I’d love to see! If you like the new stamp sets I worked with today as much as I do, you’re going to need them in your collection. They’re available now in The Rabbit Hole Designs’ shop! You’ll also find the sister post to this article on their blog! (Woot! Woot! Feel free to head over there and tell them you like my card 😉 ) As always, thanks for stopping by my friend; I really do appreciate your support! Oh my gosh this is CUTE!!! What a great idea to make a the bed to go with the family. I love it.